Fresh. Hot. Now. Krispy Kreme is set to open its doors to Davaoñeos this coming October 20, 2012. They will be opening not only one but two branches in a day. The first branch is located at SM Annex which will be opened at 9AM. The next branch will be at 12 noon at Abreeza Mall. PLUS there's more, Krispy Kreme will also open their third branch in the city at SM Lanang Premier. The date for the third store opening is not yet set. A Krispy Kreme Pre-Launching event was held at Tiny Kitchen last October 11, 2012. I was one of the food bloggers who attended the special gathering. On the pre-launching, Sir Mark Gamboa, Krispy Kreme's marketing manager in the Philippines, shared some important details and exciting secrets about their Davao invasion. The famous international doughnut brand is ready to penetrate the city's food market and to offer ultimate satisfaction to the foodies. 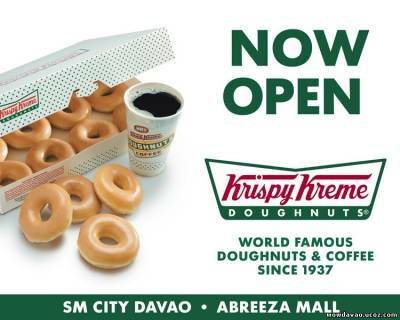 As a Krispy Kreme lover, I couldn't hide my excitement as this brand invades Davao soon! I can already smell their fresh and hot doughnuts. I can already imagine sipping their perfectly blended and prepared coffee. Lastly, I can already see my friends and I having a Krispy Kreme doughnuts party. "Spanning more than 690 shops in 21 countries, Krispy Kreme has been exciting the world with a distinct confectionery experience brought by its delectable variety of offerings, piloted by the Original Glazed Doughnut, which has won the world over since 1937. Since it first opened its doors in the Philippines six years ago, the world-famous doughnut and coffee brand has been making Filipinos fall in love with its range of signature treats. To date, Krispy Kreme Philippines now boasts of 31 stores in Luzon and two stores in Visayas—all constantly swelling with eager patrons who found that unrivaled delight brought by its products. Hence, Krispy Kreme continues to bolster its sweet success in the country through expanding with two stores down south. Located in Mindanao’s premier shopping destinations—Abreeza Mall and The Annex at SM City Davao, the newest branches further Krispy Kreme’s milestone in the country, as well as the celebration of its 75th year of bringing delicious tastes and fond memories worldwide." Staring on the 20th, Davaoñeos can already indulge into the sweetness of Krispy Kreme! THERE'S MORE: First 100 customers will receive exciting freebies and gifts from the company. These are the things that are in store for everyone (so make sure to mark your calendar now)! "Also, in true Krispy Kreme tradition, the first people—one from each of the eight (8) neighboring cities—to ring the cash register gets a year-long supply of the brand’s Original Glazed Doughnuts and Signature Coffee. Additionally, the second and third customers to fall in line will be rewarded six and three month’s worth of the same delights, respectively. The 4th to 100th purchasers are also in for treats, as they will be getting supplies of these Krispy Kreme favorites to last them a whole month. The eight (8) neighboring cities in Mindanao included in this promo are Davao Oriental, Davao del Norte, Davao del Sur, Zamboanga del Norte, Agusan del Norte, General Santos, Lanao del Norte, and Cotabato City." Yes, you read it right. Be the first buyer of a dozen of Krispy Kreme doughnuts and receive a one year supply of their original glazed doughnuts with their signature coffee. For the second buyer, he or she will receive a six-month supply. The third buyer will get a three-month supply. And for the 4th buyer up to the 100th, each will receive a month-long supply of Krispy Kreme doughnuts! So, are you ready to fall in line for the two store openings on October 20? For sure, you are already excited for the grand opening! It will be a day full of doughnuts! So, what can you expect from Krispy Kreme's arrival in the city? Drive-Thru. There is no need to fall in line in the stores before one can enjoy his Krispy Kreme orders. The Annex at SM City Davao will have a drive-thru counter wherein customers can easily get the foods they want. Those who are in a hurry do not need to get inside the door before they can enjoy the freshness of their doughnuts or coffee. Free Wi-Fi. This is perfect for everyone who wants to get online all the time. The Davao city branches will offer a free wi-fi connection to all their customers. It means fast web browsing as one indulges into his or her foods. The free internet will surely attract the market for students. Let us all say, "Maayong pag-abot, Krispy Kreme!" Thank you to Sir Mark and Ms. Stephanie of Krispy Kreme Philippines for inviting me and my fellow Davao bloggers! I'm excited for the media launch next week. Thank you also to Tiny Kitchen for the lovely meals. My next post will be about the foods you served during the pre-launching event.